Ice fishing with Sport Fish Michigan is a fun, relaxing, and comfortable experience not to be missed: for both first-time ice anglers and experienced ice anglers. All the equipment necessary for a fun day on the ice is provided, including Otter Outdoors shanties, heaters, rods and reels, Humminbird Ice Helix electronics, Marcum Underwater cameras and the lures or bait that will be used. Your shanty will be set up and heated when you arrive. Transportation on and off the ice is also included with our trips, when safe and practical. Come and fish with friendly and experienced ice Guides who grew up ice fishing the area, and can help provide a successful, fun, safe, and memorable trip out on the ice. Fishing many of the northern Michigan inland lakes, as well as some of the bigger waters like Grand Traverse Bays, Torch Lake, Suttons Bay, and Crystal Lake, our Guides can help put customers on fish and teach them how to fish in safety and comfort. 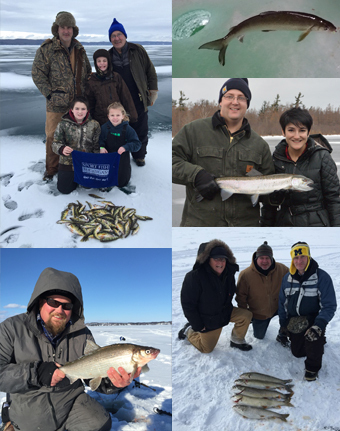 Sport Fish Michigan's Guides do all the work, so that each customer can fully enjoy their on-ice experience. From the novice to seasoned ice angler, we can help facilitate a fun and productive winter ice fishing trip. 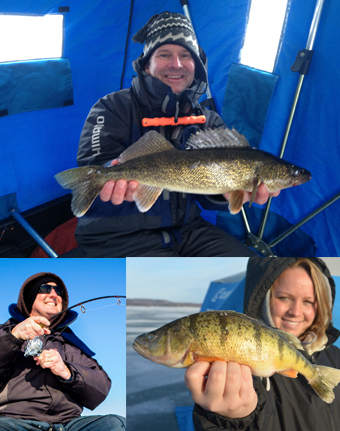 Guided ice fishing is a fantastic way to get out and wet a line during the winter chill. Guided fishing offers so much more than an ice fishing shanty rental: enjoy state-of-the-art equipment and electronics, and expert assistance from our Guides. This isn't Grandpa's type of ice fishing. This is fishing in style, from a nice, warm shelter. Transportation on and off the ice is usually provided by means of a 4-wheel Polaris Ranger Crew UTV or Ski-Doo snowmobile, taking customers directly to the ice shanties, creating a fun and exciting way to begin and end each day. 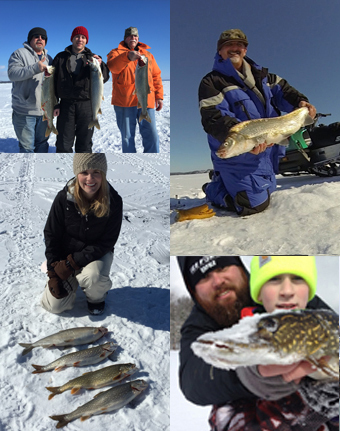 Join one of our Sport Fish Michigan's ice fishing Guides to take advantage of their knowledge of local fishing for a variety of species like yellow perch, bluegill, walleye, pike, crappie, whitefish, lake trout, smelt, burbot, and even steelhead, while you beat the winter blahs. Safety and comfort are a priority, and each Guide is there to help ensure a safe, fun, and memorable outing. Our Guides all reserve the right to change the body of water, or to cancel a trip, if there are concerns regarding safe ice or weather. 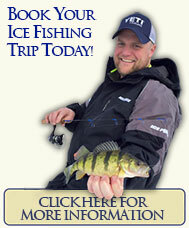 Experience Michigan ice fishing from the comfort of our fully-equipped, heated ice shanties. 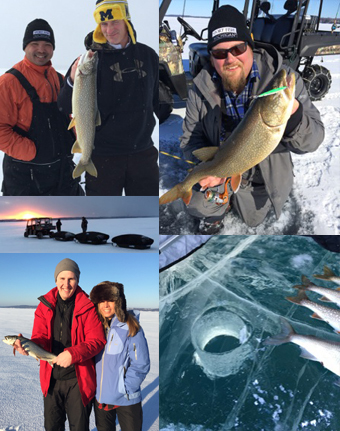 Sport Fish Michigan's Captain Ben Wolfe and Captain Chad Dilts hosted 9&10 News' Jenny Beuchel for a day of ice fishing on the Grand Traverse Bays. Chad grew up in Frankfort, and is an ice fishing addict as well as a fantastic angler. Willing to travel to find fish, Chad chases after just about anything through the ice. Any given day, the target species could be smelt, walleyes, lake trout, whitefish, pike and even burbot out on Grand Traverse Bays. He is just as comfortable on big waters jigging for the bigger species, as he is on the smaller inland lakes, targeting panfish. A super friendly and accommodating guide, coupled with his lifetime of ice fishing experience on multiple waters, Chad is sure to be a pleasure to fish with for seasoned ice anglers as well as true novices. Ben brings his knowledge of soft water fishing to the ice with extensive knowledge of Grand Traverse Bays. A big water specialist, Ben loves to jig for lake trout, whitefish and even burbot. A self-described tackle and technique junkie, he is always experimenting, trying to turn a hot bite even hotter, or a slow bite into a better bite. Although fairly new to ice fishing itself, Ben's passion for it shines through, and his understanding of the big Grand Traverse Bays chasing fish helps him and his customers to feel comfortable. Jeff is retired from the U.S. Coast Guard and loves to ice fish during the winter. A panfish specialist, Jeff has the know-how to target species like yellow perch, bluegill, and smelt on various inland lakes near Frankfort, MI. A jovial personality makes Jeff a pleasure to fish with, and his local knowledge about targeting panfish is sure to help make for many happy customers. Lake Skegemog, Lake Leelanau, Long Lake, Big Platte Lake, Crystal Lake, Betsie Bay, Grand Traverse Bay, Lake Mitchell/Cadillac. Adam grew up fishing northern Michigan's many inland waters and Grand Traverse Bays, and loves to introduce ice fishing to others. From perch fishing, to jigging up walleyes and setting tip-ups for pike, Adam is well-versed in a large variety of techniques and species through the ice. Ron is Sport Fish Michigan's newest addition to the ice Guide line-up. Hard working and fun to fish with, Ron brings a youthful exuberance to the ice, targeting a large variety of species like yellow perch, bluegill and crappies, northern pike, lake trout, and even bass! Scott is a teacher, both on and off the ice. He particularly likes working with young anglers and people new to ice fishing - sharing the excitement in hooking and fighting fish on the ice. His enthusiasm for the sport is contagious, and he strives to provide every customer their best ice fishing experience. Scott is an ice fishing nut, and loves to fish for perch, smelt and walleyes through the ice. Kyle grew up in Muskegon, and has been guiding ice fishing customers on Muskegon Lake for the past several seasons. Extremely knowledgeable and friendly, Kyle specializes in fishing for yellow perch and bluegills. As a seasoned Sport Fish Michigan Captain, Kyle is sure to show customers a fantastic time out on the ice in Muskegon. Brady grew up in Grand Rapids, and has fished all of his life. Now living near Traverse City, Brady is an expert at fishing for several different species. Jigging lake trout on Grand Traverse Bays, or walleyes, panfish, and pike on inland lakes, Brady has the experience and personality to help ensure customers have a fun and memorable time while ice fishing. The post SFM Ice Fishing Report 03.06.18 appeared first on Ice Fishing Reports. The post SFM Ice Fishing Report 02.21.18 appeared first on Ice Fishing Reports. The post SFM Ice Fishing Report 02.09.18 appeared first on Ice Fishing Reports. The post SFM Ice Fishing Report 02.01.18 appeared first on Ice Fishing Reports. First ice to late ice availability, normally mid to late December to late ice in early to mid March. Peaks can be early and late seasons on inland lakes. Peaks are throughout ice season on both inland lakes and the Great Lakes. Early to late ice availability (but not first ice), normally mid January to early to mid March. Peak fishing is typically mid to late January into early to mid March. Typical smelt bite is dusk/early night. Peaks are throughout ice season if on the Great Lakes, early ice and late ice for inland lakes. The Great Lakes have a better fishable population than inland lakes, but can be targeted. Typical whitefish bite can be first light of day and dusk/first couple of hours of dark when fishing on inland lakes. Great Lakes whitefish will bite all throughout the day. 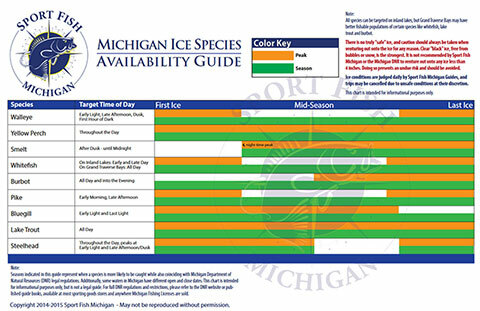 Early ice to mid ice availability, normally mid January to early to mid March . Peak fishing can be mid to late January to early March for inland lakes and the Great Lakes. Great Lakes has a more fishable population. Typical burbot bite can be throughout the day. Peak can be early season and late seasons on inland lakes. Early to mid ice availability, normally mid to late December to mid to late March. Peak are throughout ice season on inland lakes. Typical bite will be throughout the day. Peak fishing is throughout ice season on both inland lakes and the Great Lakes. Typical lake trout bite is throughout the day on both inland lakes and the Great Lakes. Early to mid ice availability and late ice availability. Peaks are early ice and late ice periods on select bodies of water. Typical bite throughout the day, peaks at early light and late afternoon/dusk. Safe ice is always judged daily by Sport Fish Michigan guides, and trips may be cancelled due to unsafe conditions at their discretion. All species can be targeted on inland lakes, but Grand Traverse Bays may have better fishable populations of certain species like whitefish, lake trout and burbot. This species guide does not reflect possible seasonal closures to certain species. Please check all DNR regulations for seasonal closures for different bodies of water pertaining to specific species.